M T D F e b r u a r y 2 0 1 9 4 E d i t o r i a l W ho better to fill in the generational gaps when it comes to hiring than a husband and wife team from different generations? Amy Noble, part of Generation X, is the special events coordinator for Black's Tire Service Inc. in Whiteville, N.C. Keith Noble, a baby boomer, is director of retail sales for the same company. 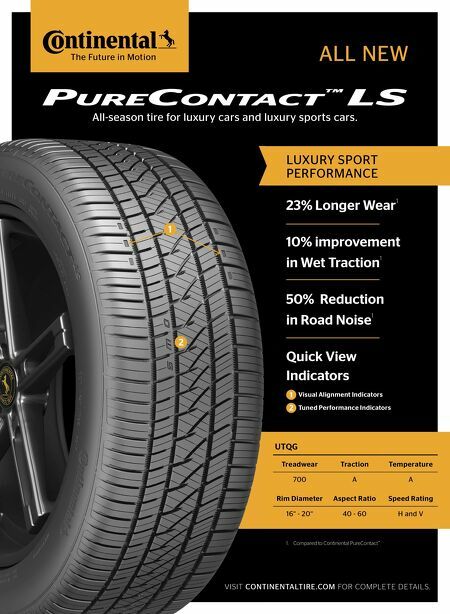 ey did double duty last December at the BTS Tire & Wheel Distributors dealer meeting in Myrtle Beach, S.C., by outlining the pros and cons of millennial workers compared to other generations. It was very interactive. Amy needled her husband about being older than she was, a trait that spans generations and gender. My dad used to tease my mom, who was only 3-1/2 months older than he was. In truth, Keith was born near the tail end of the baby boomer age range, 1945-1964, and Amy was born near the beginning of the Gen X age range, 1965-1979. Some of their generational traits overlapped. Keith said baby boomers represent some 74 million people. And it's not uncommon for them to average at least 15 years with one employer. Millennials, born between 1980 and 1995, represent about the same number of workers, but their average tenure per job is about 18 to 24 months. "I think the millennials get a bad rap for being lazy and not wanting to work," said one tire company representative in attendance. "ey don't mind working. ey just want to work when they want to work. "ey want to start work at 6 a.m. and then stop at 9 a.m. and go work out at the gym at your facility or down the street. en they'll come back and work the rest of the day. "A lot of them only want to work three or four days a week. ey want to work Monday, Tuesday and Wednesday, 12-hours each day, and get ursday, Friday, Saturday and Sunday off." In order to get the job done six or seven days a week, a company has to set up staggered shis, he added. If you want a millennial to work 60 to 80 hours a week, he won't last 18 months, said Keith. "He won't last 18 days," said an attendee. When asked if they thought the average tenure for millennials was also the result of job sites like LinkedIn that give them seem- ingly unlimited opportunities on a daily basis, the Nobles agreed. "It gives them flexibility," said Amy. "It goes back to our digital age, electronics, easy access to so much information," said Keith. Here's another generation gap. Baby boomers don't talk about their compensation to coworkers. It's very private to them, said Keith. e topic is a little less private to Gen X workers, who might share that information with a trusted co-worker. And millennials? ey are completely transparent, said Amy. "I experienced an example of that this week," said Keith. "e first thing the new guy did was go into the shop and tell everybody what he was making." When that happens, the potential fallout can be messy, he said. "What does your employee handbook say about that?" asked a dealer. "It says it is private and must be kept to yourself," said Keith. "is generation expects your handbook to fit into their char- acteristics," said Amy. Whether you have to make allowances for millennials or "think outside that box," as one dealer put it, millennials already have been replacing the "matures" (born prior to 1946) and baby boomers in the workplace. e Nobles le the dealers in attendance with strategies for cross-generational leadership. 1. Re-energize your compensation and benefits. Baby boomers value monetary compensation, where Gen X and millennials value time off for their hard work and efforts. 2. Expand your communication strategies. Make your company messages available in different formats, including emails, texts, phone communications, etc. Create opportunities for cross-training so the generations can learn from one another. 3. Make mentoring a constant. Make mentoring part of the employment cycle, as it will ensure that your company's history and knowledge continue from one generation to the next. You as leaders must remain open to new ideas and provide constant feedback. ese strategies may not help you with members of the next generation, Gen Z, some of whom have yet to be born. But the learning curve won't be as dramatic. ■ If you have any questions or comments, please email me at bob.ulrich@bobit.com. 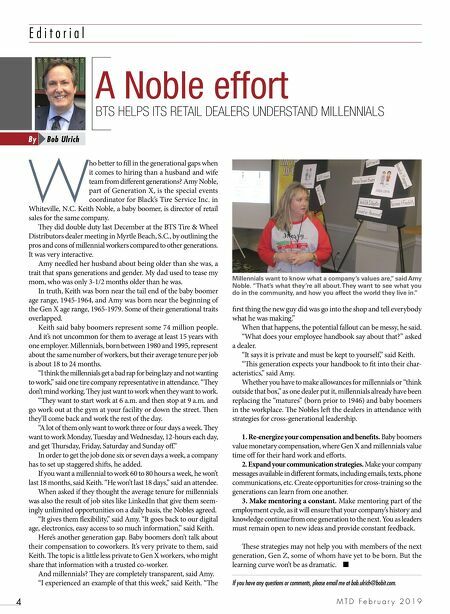 A Noble effort BTS HELPS ITS RETAIL DEALERS UNDERSTAND MILLENNIALS Bob Ulrich By Millennials want to know what a company's values are," said Amy Noble. "That's what they're all about. They want to see what you do in the community, and how you affect the world they live in."